We provide the very best dog home boarding near you in Royal Tunbridge Wells, Edenbridge, Crowborough, Paddock Wood and surrounding area. Dogs deserve a holiday too! 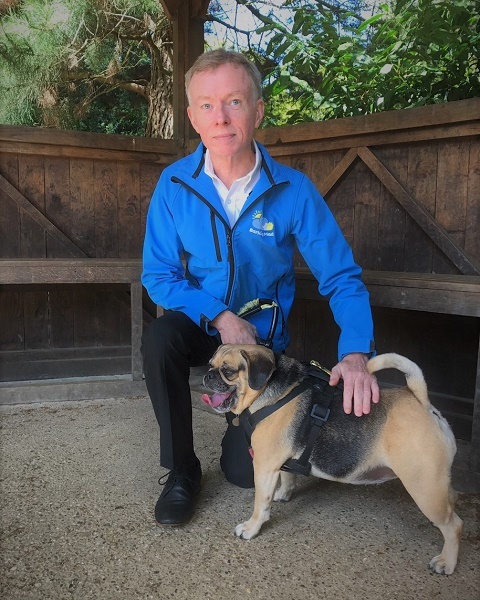 Hi my name is Paul and I’m proud to be the owner of the Royal Tunbridge Wells home boarding dog holiday service. We offer one to one dog care with all the trimmings – we’re rated No.1 and 5* by TrustPilot. I understand how hard it can be to find someone to look after pets whilst away. I chose not to use kennels for many reasons including the worry of being out of touch and not knowing how they were. I enjoy being part of the Barking Mad family and giving wonderful family pets, a home from home holiday which in turn, allows families to go on holiday without the worry of leaving their pets behind. I have been lucky to have travelled the world either through work (airline industry) or just to experience different cultures whilst relaxing and unwinding. I have been a keen dog lover all my life and have enjoyed many breeds, from my grandparent’s miniature toy poodle called ‘Jet boy’ due to his wonderful black curly coat, to my largest to date, a wonderful Bernese Mountain dog called ‘Saffie’ who thought she was a lapdog but never quite managed to get her whole body on a lap but was never put off trying. I became aware that my local Barking Mad dog business was for sale and the rest is history! So don’t delay, call me today and I will happily pop over to meet you and chat about the best possible way to care for your dog whist you are away on your holiday. Also, if you fancy becoming one of our dedicated hosts and would like to know more, by all means get in touch.